Get the best 360 degree car bumper protection with the patented BumperBlocker front and rear car bumper protectors. Parking in a parking garage environment can be risky – the lack of space and overcrowding means that cars must be maneuvered within inches of other vehicles, cement columns, walls and other obstacles. 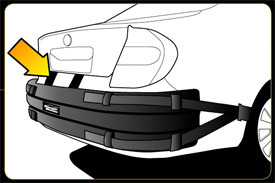 Why not protect your car bumper with the only quality front and rear bumper guards designed for indoor parking garages. Don’t settle for less than the best! For maximum car bumper protection BumperBlocker car bumper guards are comprised of 2” impact absorbing foam covered in a weather resistant (not waterproof) 100% cotton material. 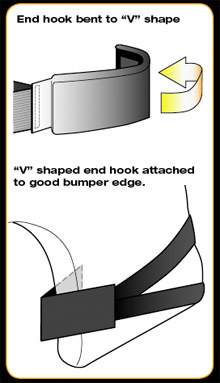 Only the BumperBlocker car bumper guard features the patented technology “QuickJust” Elastic Velcro straps and “FlexBody” structure. 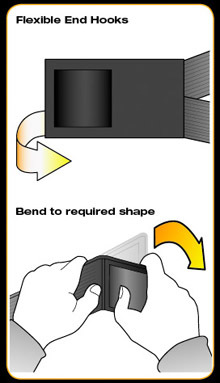 Front and rear bumper guards can be rolled up or folded for easy storage. 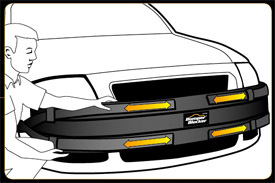 Quick Install: You attach the product by hooking the end hooks to the bumper edge. The end hooks are flexible, so you can bend them as needed. Adjust the velcro straps to shorten or lengthen the size. Step 1 - Bend the flexible end hooks to resemble the letter "L" or "V". The exact configuration will depend on the wheel well shape. Step 3 - Hook one end of the product to the bumper edge and while applying tension hook the other end. 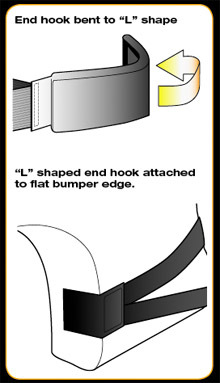 Step 4 - If attaching the rear bumper protector, you can drop the straps into the trunk area. Closing the lid will secure the straps and keep the product from sliding. DO NOT BLOCK - rear exhaust pipes, as it may allow dangerous fumes to enter the vehicle. Vehicle should be in an off position. Do not Drive with product attached. Do not use security straps under the front hood (in engine compartment). Remove straps with scissors before installaing near engine.